There’s a company called Kevo which allows you to open your home door just by tapping the lock. An app on your nearby phone does the rest of the work. With all the technology available to us today, it’s interesting to see which companies embrace what, and exactly how they roll out the campaigns to their audience. Volvo has recently introduced their new Bluetooth-enabled locks on their 2017 cars, and they’re pretty proud of themselves for it. When you’re finishing up a meal in a busy restaurant during the winter, there’s nothing worse than the anticipation of getting into the wind just so you can get brave your way to a freezing car. Volvo’s new system lets you start the car with the app even when you aren’t close to your car so you can instantly get in and drive off. The exact distance of this app is currently unknown, but Volvo will likely be revealing more details in the months to come. While you can also open your car from far away, obviously you might want to save that feature for when you think your car is safe from would-be criminals. It’s a bit of a rarity anymore to have people lock themselves out of their cars though it still does happen. Instead of causing your body or your car damage trying to unlock the door from the outside, it’s nice to have the proximal features of the app. Even if you somehow managed to lock your phone in the car, it would still allow you to open it from the outside. It’s not just your own personal phone that can use this app, you also have the ability to give permission and authorization to friends and family. This way if there’s an emergency, even if you have the keys with you when you’re vacationing in Australia, you can still have someone use or move your car if need be. These types of unforeseen situations come up more often than you might think, so it’s always nice to have options to solve these pesky problems. 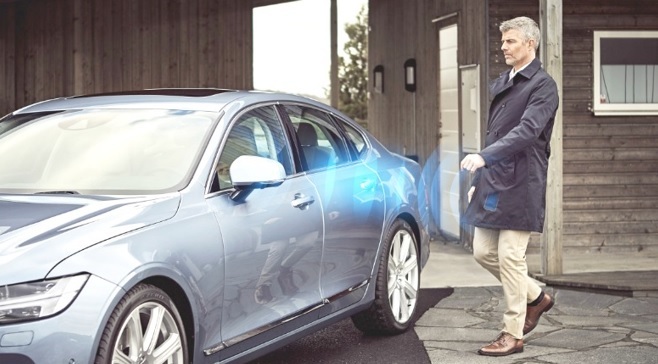 Volvo is not the first company to embrace technology that will allow its drivers to start and open their cars from a farther distance than a regular fob, but they do seem to be at the head of the pack in terms of putting everything on your phone. This is all about your own convenience and preference. You likely use your phone all day every day for practically everything, and it can be nice to consolidate so it opens your car as well. If you keep everything together (keys, wallet, phone, etc. ), and it’s all stolen, then a thief now has access to your vehicle. If just your phone is stolen, then your lock screen will hopefully stop the criminal from getting in and driving off, however there are bound to be situations when your phone is unsecured. The police can help track down your car using the phone’s GPS and tracking system, but it does nothing for whatever’s inside your car already. One more really cool thing about this app is that it’s already being tested right now in Europe. We all know what it’s like to try apps that have multiple bugs that haven’t yet been programmed away. This increases the odds that if you do buy a 2017 car, then you’re much more likely to get the full benefits without the hassle. They also might be able to increase the range as well. No matter how you open your car, if you’ve recently had the misfortune of getting a ticket then you’re going to need some help in putting it behind you. Depending on your state, traffic school courses can possibly eliminate points on your license or even have the citation dismissed. Even if you haven’t had any run-ins with law enforcement, traffic schools may get you a discount with your insurance provider. Conscientious, safe drivers make for smarter investments for insurance companies. Make sure you choose a company that won’t bore you to tears while you learn!